This online slot game brings the magic to life with miraculous fairies zooming around the screen and creating this enchanting theme. The game is made by the developers at Iron Dog Studios who have adopted a 5 reel slot game with 20 paylines. This is a magnificent combination of online gaming and creative theming that leads to an enjoyable experience. The game is also suitable for a range of betters with a minimum stake of 0.40 – leading to a max of 80.00. On top of that, there is an unbelievable top payout of 120,500 up for grabs in the form of a cash payout! There is a multitude of bonus features available here that can add some satisfying rewards to your original bet! Look out for wild symbols, sticky wilds and expanding reels. 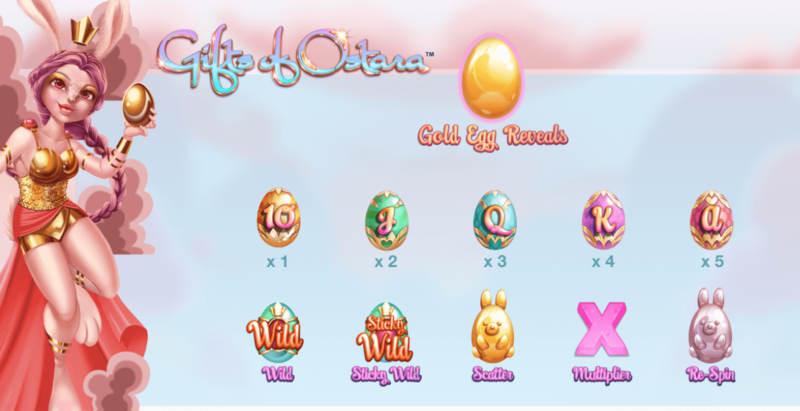 Not to mention the option for respins and free spins and it is worth keeping an eye out for some of Ostara’s magic too! You tend to not hear the developers name (Iron Dog Studio) all that frequently but they exist with the reputable 1x2 Network. Their work aims to create entertaining themes and interactive gaming online to keep players entertained and help to build their online portfolio. In doing so, they aim to keep up to date with current technological advances and ensure that their games are suitable on a variety of platforms; running at a sound quality level. The background to this game are set in a magical forest which has an endearing and enacted feel. In the distance you will spot a wishing well which is where Ostara lives. The symbols come in the form of well-dressed and colourful Easter eggs with a card value imprinted upon them. Additionally, there are sweet treats up for grabs within the symbols. These come in the form of cupcakes and colourful jelly beans! 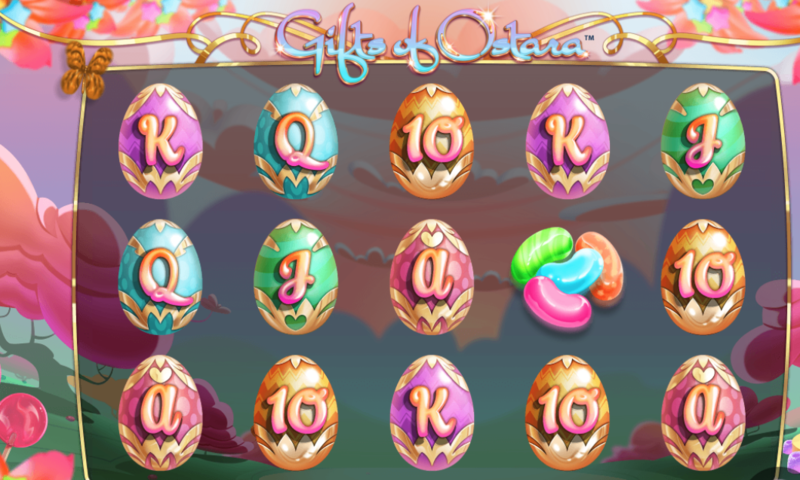 Free spins can be generated through a feature at the side of the reels which collects additional easter egg symbols of the same card value. During free spins the golden egg revealing wilds, respin, scatter and multiplier cannot appear, but during free spins the icon that activates the feature acts as a special symbol with a base multiplier. Each of those icons collected during the 10 free spins will be multiplied by the base multiplier and added to the total win at the end of the free spins. Ostara is the mystical symbol you want to see appearing on the reels because she have the ability to produce special symbols such as wilds. 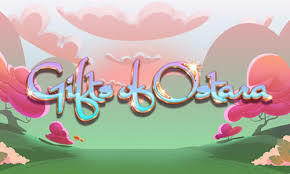 Ostara can also act as a sticky wild for up to 3 respins which creates an opportunity will randomly make an appearance on the reels and either add special symbols such as wilds, or she will remain sticky for up to 3 respins – when this happens, you'll have the possibility of a hitting a big win. So, join & spin today to get access to an incredible range of bonuses and promos. This is a highly appealing game for many levels of players because of the ability to play it safe with low bets or to have a big win with the bonus features available! The theming is strong and the magical presence works a treat! Play slot games online by the same developer here on Easy Slots.